There are many pastries/desserts I love that I frankly never plan to make. They are far above my skill level and it just makes much more sense to leave it to the professionals. I would say Mont Blanc - a dessert I adore featuring pureed chestnuts - was one of them. Somehow I'm able to say "was" because I recently made some in my very own kitchen! I suppose it started with a jar of roasted chestnuts. After the holidays, I look out for them at William Sonoma when they typically go on sale. I was only able to get my hands on 2 jars this year and after using one to make a ragù, I kept thinking about two Mont Blanc recipes I'd spotted lately...one from Angelina's in Paris (which I have tasted and well-remember) and a feature in the November/December issue of Bake from Scratch. So that's how mine came about - a simplified Mont Blanc in tartlet, or mini tart form, each just a little over 2 inches in diameter. And while there are variations on the Mont Blanc, mine starts with the almond pastry crust. Inside the crust, I nestled a little sweetened chestnut puree or chestnut paste before I piped a peak of sweetened whipped cream on top. Finally, I piped the chestnut paste all around the whipped cream. In essence, I skipped the meringue you sometimes find at the bottom of a Mont Blanc (it's not my favorite component anyway) and there's no almond filling. Instead I just added some of the chestnut puree at the base of the tart for a little more chestnut flavor. If you could do me one favor, it would be not to look too closely! If you don't scrutinize too hard, you might not notice the uneven piping and wiggly lines. Needless to say, my version is not only simplified but rustic. That said, I couldn't help but feel excitement - and a little sense of pride - at having made one of my favorite desserts, even if it is a simplified version. When I decided to embark on this little baking project, it started with the idea of making small tartlets. For me, making things on a smaller scale and doing small batches seem a lot more manageable! I knew I wanted to use mini tart pans with a little bit of depth. I realized I only had 2 tartlet molds that fit that description. After a thorough search, I was able to find half a dozen more similar molds at Bed, Bath & Beyond (they only cost about 50 cents a piece so it was an inexpensive investment). If you look closely, you might notice that 2 of the tart shells are slightly larger by about 1/4 inch. The nerve-racking thing is popping the crusts out of the molds in one piece! As added insurance, I greased the tart molds with baking spray before pressing the dough into them. After letting the baked crusts cool, I gently tap them on one side and ease them out. If necessary, you can carefully use the point of a small paring knife to help. But the star of the dessert must be the chestnut component. Start with already roasted chestnuts (I used the jarred kind) and you save an onerous step of having to roast them (and peel them!) yourself. To make the chestnut puree or paste that gets piped all around the dessert, you simmer the roasted chestnuts in water and a vanilla bean for about 30 minutes, or until the chestnuts soften. I remember thinking I would like a perfume that smells like this pot of chestnuts cooking - a wonderful scent of warm sweet vanilla. Incidentally, you can save a further step and skip this cooking process if you can get your hands on canned chestnut puree. Once your chestnuts have softened, remove the vanilla bean, drain the chestnuts and and process it in a food processor. It will look dry like this below. Then...here's the key...slowly add some simple syrup (yes, you need to make that but it's just a simple equal ratio of water and sugar cooked until the sugar is melted and then cooled) to the pureed chestnuts and process together until you get a smooth texture in a consistency that can be piped. I erred on the side of not adding too much simple syrup. It's a good idea to split this project over a couple of days. I made the tart dough and shaped them into the molds a day ahead. I also made the chestnut paste a day ahead. On the day I was ready to finish the dessert, I baked the tarts and whipped the cream with sugar and a little vanilla extract. To assemble, I started by piping a bit of the chestnut paste to the bottom of the almond crust. Without a meringue or almond cream to nestle at the bottom, I thought it would be good (not to mention easy since we already have it) to put a little extra chestnut into the tart. I started piping the chestnut paste with a pastry bag that had a small round tip attached but it quickly ripped open on me! In the end, I found a plastic freezer bag with an opening cut at the tip worked just fine for piping the chestnut paste. After that, I piped a mound of whipped cream on top. 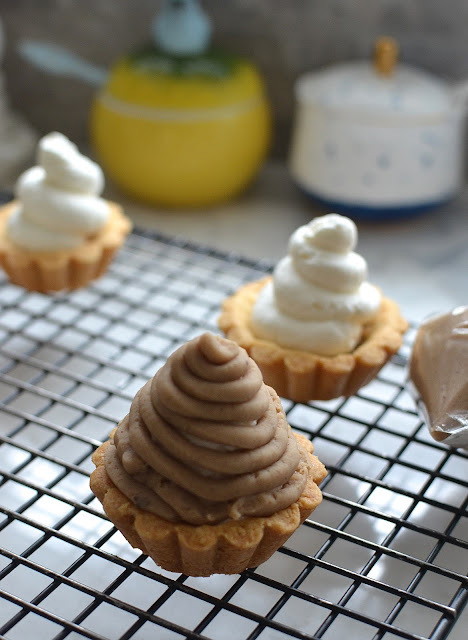 Once you finish piping the whipped cream on all the tartlets, take an small offset spatula and smooth out the ridges of the whipped cream to even it out. The aim is to shape it to a pointy peak, resembling a mountain. Then, steadily pipe chestnut paste all around the whipped cream in a circular motion, starting at the base and working your way up to the peak. For novices like me, it will inevitably be necessary to stop and make some adjustments and fill in gaps. I was okay with all the imperfections. I was thrilled to get this far! At one point in the project, I wondered what I'd gotten myself into, thinking maybe I should have just spent the time going to a good pastry shop and buying a Mont Blanc there! But there is a special satisfaction that comes from learning, and making something yourself. It is its own kind of magic. 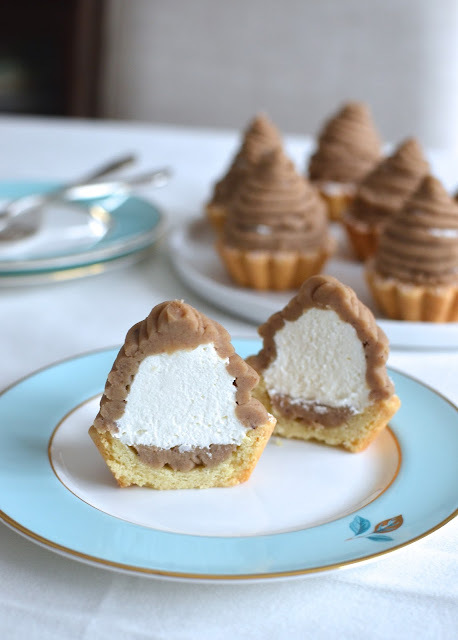 Sitting down and tasting these homemade Mont Blanc tartlets was exciting. The almond tart crust is rich and buttery - quite addicting. The chestnut paste was not very sweet (likely since I didn't add a lot of the simple syrup) so the sweetened whipped cream was a great partner with it. If you like chestnut desserts like I do, you'll know what I'm talking about. From this project, I had leftover pastry so I made extra mini tart shells and tucked them in the freezer (one of which has already been turned into a chocolate tart for my son, as he requested, and I have lemon tarts in mind for the rest). Since proportions are a little difficult to be precise about here, I had some chestnut paste and whipped cream leftover too. Frankly, I served my tartlets with a good dusting of confectioners' sugar and quenelles of extra chestnut paste and whipped cream. I may have even eaten the last of the extra chestnut paste with a little more whipped cream, and a spoon! For my birthdays, I often request a chestnut cake - a kind you often find in a Chinese bakery. It's simply a couple layers of pillowy soft sponge cake with whipped cream and chestnut paste just like this. I can't help but smile knowing I've got that cake fairly decoded now. Finding out how things are made is a little like learning the magician's secrets. It's early yet in the new year but I'm grateful to have already learned a few new things in the kitchen! Butter and flour (or grease evenly with baking spray) eight (2 1/4 to 2 1/2 inch diameter) mini tartlet molds. Grab a small ball of dough (about 23 grams worth) and place it into the center of the mold, pressing the dough into the bottom and up the sides. Use a small paring knife to trim excess dough from the fluted edges. Repeat with remaining tart pans. Discard any extra dough left over. Refrigerate the tart shells for 20 minutes. Preheat oven to 350 degrees. Remove tarts from the refrigerator and set on top of a baking sheet. Take a small fork and poke each pastry a few times. Bake until golden, 20-25 minutes. Take a look midway during baking and if pastry is puffing up a lot, gently press it down using the back of a small spoon. Once baked, let cool on a wire rack. To remove crusts from the mold, gently tap the side of the pan a few times on the counter and ease them out. If necessary, you can use the sharp point of a small paring knife to help edge the crust out. Prepare chestnut paste: Split the half vanilla bean lengthwise with a sharp paring knife; scrape out the vanilla bean seeds. In a medium saucepan, place the roasted chestnuts, the split vanilla bean with the seeds, and 2 cups of water over medium-heat. Bring to a boil, then reduce the flame to low, cover, and simmer until chestnuts are softened, about 30 minutes. Remove the vanilla bean pod and drain the chestnuts. Place chestnuts into the bowl of a food processor. Pulse until a thick paste forms, scraping the bowl as needed. With the food processor running, slowly add a steady stream of simple syrup until a piping consistency is reached. Add a little simple syrup at a time (I used about 1/3 cup so you will have syrup leftover), stopping often to check the consistency so as not to make the chestnut paste too thin. Transfer the chestnut paste to a bowl, cover, and refrigerate until ready to use. Make whipped cream: Place heavy cream in the bowl of a stand mixer fitted with the whisk attachment. Beat on medium speed until soft peaks form. Gradually add confectioners' sugar, beating until it reaches stiff peaks. 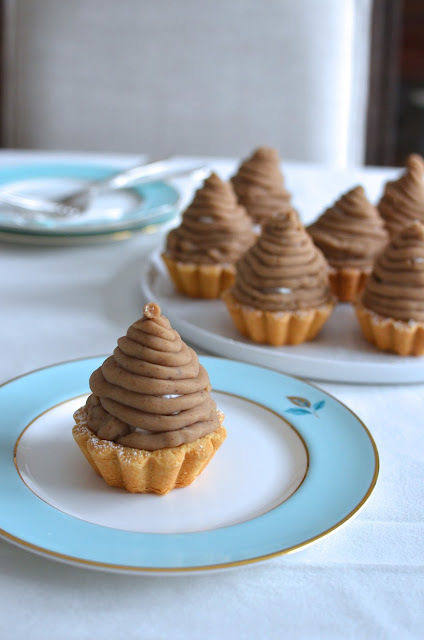 Assemble Mont Blanc tartlets: Place chestnut paste into a large pastry bag fitted with a #10 or small round tip (alternatively, place it into a large plastic freezer bag and snap a small opening at the tip). Pipe a little chestnut cream into the bottom of each tartlet crust. Next, transfer the whipped cream to a large piping bag fitted with a larger round tip such as Wilton 2A. Pipe on top and around the chestnut cream in a circular inward motion to make a small peak. Use a small offset spatula to smooth out the ridges. Starting at the base, pipe chestnut paste in a circular motion all around the whipped cream to create a swirled cone shape. Repeat process with all the tartlets. 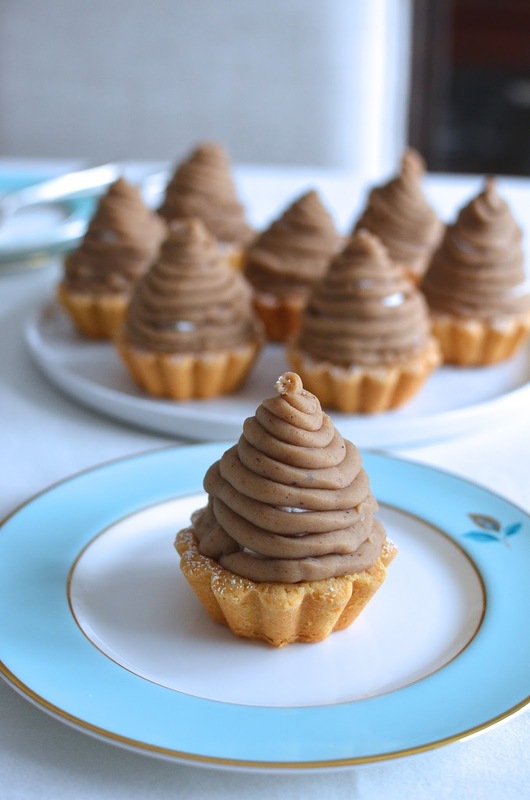 Store tartlets in an airtight container, in the refrigerator, until ready to serve. Right before serving, you can dust the tartlets with confectioners' sugar to mimic the look of a snowy white mountain, or Mont Blanc; however, I want to note that the confectioners' sugar melts very quickly on the chestnut paste. They look perfect to me! I wish I could taste one of yours :-)) Creamy chestnut tastes so good! You are an amazing baker Monica! These must taste incredible. I've never had one, but want one now :) So pretty! Monica, never heard of Mount-blanc before but they look and sound amazing. Your pics are the best!!!! So sweet of you...thank you, Cheri. OMG! those are the cutest little desserts ever. Have never tried to make homemade chestnut paste. Love everything about this recipe. It was a fun thing for me to learn, too. Glad you like it! I totally thought of you the other day when I saw chestnuts at the grocery store! And now you posted this :) These look delicious!! Definitely a new to me dessert but I will most certainly take a few! Love that! Thanks for thinking of me, Ashley! haha! These look absolutely perfect! What a beautiful thing to make and they sound delicious too. They're so beautiful. Wow! Your skill level is beyond perfect. How I would love to taste them..YUM! Thank you, Sonali but...are we looking at the same thing?! haha. Appreciate the kind words. I'm learning as I go as well. Thank you, appreciate it! They are SO CUTE! I recently had a mont blanc tart. It was very tasty! It would be even better to make them and have tons of them. Where did you buy the chestnut in a jar?